An instrument measures air duct tightness, diagnoses leakage problems, and estimates energy efficiency losses from duct leakage. The Duct Blaster Test measures and diagnoses air leakage problems within a home’s forced-air duct system. Air leakage in a home’s duct system can greatly increase heating and cooling costs - sometimes more than 30% - and can contribute to comfort, health and safety problems. Finding hidden air leaks can be next to impossible without the use of a Duct Blaster. 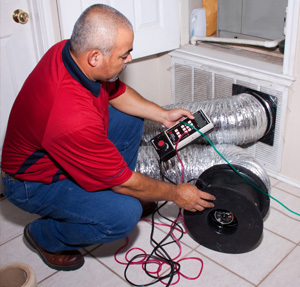 A Duct Blaster is a fan and pressure gauge that pressurizes the home’s duct system and accurately measures turning air leakage within the duct work. The Duct Blaster is connected to the return grill or air handler. All of the registers and/or supply grills are covered in order to create a closed loop in the system. The fan is turned on to 25 Pascals to balance the pressure in the duct system. Once the duct system is pressurized, it reveals any air leakage around the plenum area, the joints, and the flexes. Any duct leakage represents heating and cooling energy loss. 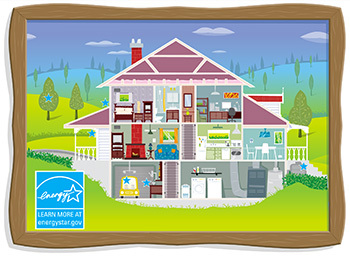 LgO will conduct the Duct Blast Test in order to identify possible leaks in the home’s duct system. The inspection results and any repair recommendations are provided to the customer. Repairs are then made by a contractor of the customer’s choice. At the customer’s request, LgO will make a follow-up inspection to ensure the repairs are within energy efficiency guidelines. A second inspection is required if the customer is requesting any applicable rebates from CPS Energy.